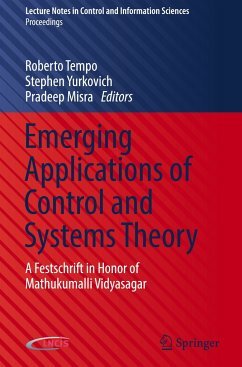 This book celebrates Professor Mathukumalli Vidyasagar's outstanding achievements in systems, control, robotics, statistical learning, computational biology, and allied areas. 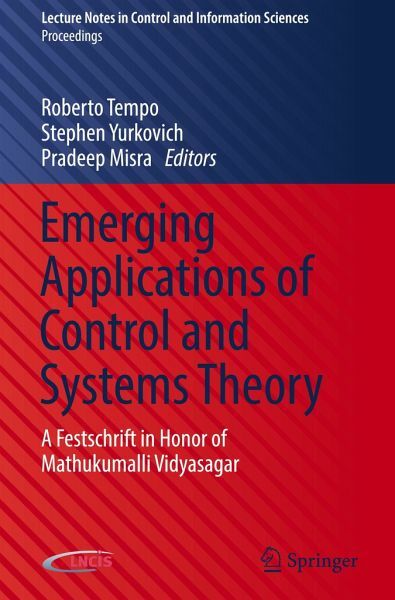 The contributions in the book summarize the content of invited lectures given at the workshop "Emerging Applications of Control and Systems Theory" (EACST17) held at the University of Texas at Dallas in late September 2017 in honor of Professor Vidyasagar's seventieth birthday. These contributions are the work of twenty-eight distinguished speakers from eight countries and are related to Professor Vidyasagar's areas of research. This Festschrift volume will remain as a permanent scientific record of this event. Mathukumalli Vidyasagar was born in Guntur, India on September 29, 1947. He received the B.S., M.S. and Ph.D. degrees in electrical engineering from the University of Wisconsin in Madison, in 1965, 1967 and 1969 respectively. Between 1969 and 1989, he was a Professor of Electrical Engineering at Marquette University, Milwaukee (1969-70), Concordia University, Montreal (1970-80), and the University of Waterloo, Waterloo, Canada (1980-89). In 1989 he returned to India as the Director of the newly created Centre for Artificial Intelligence and Robotics (CAIR) in Bangalore, under the Ministry of Defence, Government of India. Between 1989 and 2000, he built up CAIR into a leading research laboratory with about 40 scientists and a total of about 85 persons, working in areas such as flight control, robotics, neural networks, and image processing. In 2000 he moved to the Indian private sector as an Executive Vice President of India's largest software company, Tata Consultancy Services. In the city of Hyderabad, he created the Advanced Technology Center, an industrial R&D laboratory of around 80 engineers, working in areas such as computational biology, quantitative finance, e-security, identity management, and open source software to support Indian languages. In 2009 he retired from TCS and joined the Erik Jonsson School of Engineering & Computer Science at the University of Texas at Dallas, as Cecil & Ida Green Chair in Systems Biology Science. In 2010 he was named the Founding Head of the newly created Bioengineering Department, a position that he held until 2013, at which time he moved to the Systems Engineering Department. Starting in 2015, he has begun to divide his time between UT Dallas and the Indian Institute of Technology Hyderabad, under the auspices of a Fellowship awarded by the Government of India. His current research interests are in the application of stochastic processes and stochastic modeling to problems in computational cancer biology and to compressed sensing.